Monopoly is, of course, the popular family board game that's been played in the United States since 1903. The casino games, on the other hand, are popular because of the rise of the casino industry in the city since 1976. That was the year that voters legalized casino gambling in the city. Unlike Las Vegas, the number of casinos in Atlantic City can be counted using the fingers of both hands. 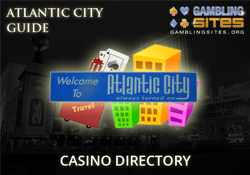 This particular Atlantic City casino directory is complete, listing all the casinos in the city. We've also provided some information about each casino, along with details about which customers will find which casinos best for their needs. We've included details about the online casino games available, too, but these are restricted to New Jersey residents. The following is a list of all the casinos currently operational in Atlantic City. Bally's Atlantic City is a hotel casino skyscraper facing the beach. It's less than a 10 minutes walk from The Pier Shops at Caesars and to The Walk, so it's perfect for shoppers. It's a first class hotel with standard amenities in the rooms: flat-screen television, miniature refrigerators, free wireless. You can request an ocean view or a room with a coffee maker when you check in. The property hosts 2 casinos with over 200,000 square feet of gaming—the main Bally's casino and the Wild West Casino, which opened in 1997. In August 2015, Bally's paid out $143 million in slot machine winnings. If you notice an Asia theme in that list, it's not just you. Bally's intentionally presents an Asian-themed variety of slot machine games, many of which are unique to their casino. Their video poker selection is also impressive. You can play the following variations for nickels, quarters, or dollars. You can apply for credit at the casino online at their Total Rewards site. In fact, all the player rewards for Bally's are handled through that site, but it's better than most slot clubs. The program includes rewards at 40+ casinos throughout the world, including Caesars and Bally's destinations in Las Vegas, Lake Tahoe, and New Orleans, among others. You can also earn credits toward world class entertainment like Celine Dion and Elton John in Las Vegas. Points can also be accumulated toward staying at any of the 40+ hotels in the network, including names like Caesars, Harrah's, Horseshoe, Bally's, Flamingo, Grand Biloxi, Harveys, The Quad, Paris, Planet Hollywood, Rio, Roadhouse, and Showboat. Location-specific promotions vary based on the time of year, but some of the current offers include 50% off food on Wednesdays in October. This effectively doubles the amount of rewards you get for dining. Also, on Saturdays in October, Bally's is holding their "Boardwalk Bucks" promotion. Total Rewards members get a free entry into a drawing. They also get additional entries based on how many player points they've accumulated by gambling. The prize package includes over $8000 in free slots play. Bally's offers more than just gaming machines and slot club promotions, though. You can play table games like Four Card Poker, Spanish 21, Three Card Poker/Six Card Bonus, Let It Ride, Caribbean Stud Poker, Pai Gow Tiles, Asia Poker, craps, Big Six, High Card Flush, and Casino War. The WSOP Poker Room at Bally's features 42 tables with Texas hold'em and Omaha games. They also have daily tournaments and official World Series of Poker Circuit Events. One example of the kinds of tournaments on offer there include the $1000 Guarantee, which has a $30 + $10 buy-in. This is held every Friday, Saturday, and Sunday at 3pm. The poker room at Bally's also features 20 high definition TVs, free wireless Internet, tableside food delivery, and games 24 hours a day. If you meet the playing minimum, you also get free parking. Bally's online casino is powered by Caesars Interactive. Games are only available to New Jersey residents. You can play on any device; the Internet casino is mobile friendly. Many of the games are powered by Aristocrat, who are well-known for their innovative slot machine games. Some of their online slot machine games include the following. The Borgata is a luxury hotel and casino that overlooks the marina. It's only a couple of miles from the Atlantic City Boardwalk. The hotel offers stylish, modern facilities with flat screen televisions in every room and marble bathrooms. You can request a suite, which includes a soaking tub and might also include a 52 inch big screen television. Like most luxury hotels, the Borgata offers more amenities than most people will ever take advantage of in a single stay. They include a fitness center, a salon and barbershop, multiple retail shops, and a spa with 6 swimming pools. The variety of dining options is staggering, including restaurants from Bobby Flay and Wolfgang Puck. Poker slots are what Borgata calls their video poker games, which include popular games like Aces & Faces, Triple double Bonus, and Multi-Strike Poker. Reel slots include famous games like Diamonds of Dublin, Cleopatra, and Flaming Red 7's. Their video slots games include Batman, Bejeweled 3D, and Cash'm if You Can. Table games include blackjack, craps, baccarat, mini-baccarat, roulette, Pai Gow tiles, Four Card Poker, Flop Poker, Spanish 21, Let It Ride, Three Card Poker, Caribbean Stud Poker, and Big Six, among others. The poker room features daily poker tournaments. Some of these have huge guaranteed prize pools, like the $100,000 Guaranteed Mini-Series. Promotions in the poker room include prizes like the $10,000 Ultimate High Hand and the $15,000 Royal Flush bonus. The Borgata also has the only racebook in the city. It's a state of the art facility with 100 seats and individual flat screen televisions. The Borgata's Players Club card allows players to earn slot and comp dollars based on how much play they bring to the casino. They send frequent special offers to members via email. Players club members also get free parking at the hotel. Signing up for My Borgata Rewards is something you can do online. They have a standard form that most people should have no problem filling out—it's just a matter of inputting your name, address, and phone number—all standard stuff. Like most casinos, Borgata also offers multiple promotions to encourage players to try their facilities. These change from month to month, but here are some examples of the kinds of promotions they're running in October, 2015. They have a "Pick the Pros" football challenge, where you can participate in a $1 million contest where you pick the winning lineups for the week during football season. They're also giving away a Mercedes on October 11. The number of entries you get in the sweepstakes is based on entering your My Borgata card into a slot machine between noon and 8pm that day. They also offer slot machine tournaments with $20,000 in prizes and free entries for My Borgata members. They also have promotions like "Sevens Are Even Luckier When You Repeat Them", which has a winner every 7 minutes. The Borgata also offers online casino games and real money Internet poker games, but these are only available to New Jersey residents. The casino games are available in both a browser-based and a downloadable version. Their focus is largely on slots, and they offer a nice selection of progressive jackpots. They do also offer table games, though. Caesars is a huge ancient-Rome-themed hotel and casino located right smack dab in the middle of the Atlantic City Boardwalk. It's a luxury property—not as nice as the Borgata, but definitely a cut above your standard first class property. It's an ideal location if you want to walk around the Boardwalk area of Atlantic City—it's only a 10 minute walk from almost anything you'd want to do there. Even though the overall theme for the hotel is based on ancient Rome, the rooms themselves are modern and have state of the art amenities, including flat screen televisions and miniature refrigerators. You can request an ocean view when you check in. Other hotel amenities include the rooftop pool, the fitness center, and the spa. The casino itself offers over 2000 different slot machines to choose from, in a staggering variety of denominations. Gamblers can play for as little as a penny per spin or as much as $1000 per spin—Caesars caters to low rollers and high rollers alike. They also offer all of the standard video poker games, like Jacks or Better or Deuces Wild. Caesars also owns and operates the casino at Bally's, so much of their approach—in terms of operating a casino—is the same. The only major difference is that Caesars has less of a focus on the "Asian-themed" slot machines that Bally's has. And in terms of what they offer at their online casino, the details are exactly the same, as Caesars powers the online casino on Bally's website. The Golden Nugget, located in the Marina District of Atlantic City, has undergone several changes in names and ownership since it was first built in the 1980s. The hotel offers over 700 rooms, two entertainment venues (a 2000-seat ballroom and 462-seat theater), and 8 restaurants. Once used to film television game shows, the casino has its own broadcast tower and a Christian music radio station leases the broadcast facilities. The Golden Nugget is more of a mid-range hotel. If you're looking for luxury, you'll be better served by staying at Caesars or The Borgata. But if you're looking for a good room rate and a fun casino at which to play, the Golden Nugget is worth a look. The casino offers over 1400 slot machines, table games --including baccarat, blackjack, craps, and roulette-- tournaments, and an 8-table poker room. The casino itself has just under 80,000 square feet of floor space. The high limit slot machine room features over 116 different machines, private restrooms, and comfortable seating. Members of the slot machine club there get free parking every day. Strictly Slots magazine readers voted this casino "Best Nickel Slots" in Atlantic City. They also have frequent promotions, like their $1 Million Golden Gridiron contest, which runs throughout football season. Their Bingo Bonanza promotion is also cool. In October, they're offering slot machine tournaments every Sunday, with $10,000 in cash available to the winners. These are just examples of the kinds of casino promotions they offer—specials vary based on when you're visiting. Members can also play games online. They must be physically located within the New Jersey state lines to play. Their online casino offers over 200 different casino games. You can also get $200 cash back on your first deposit and a $50 referral fee if you refer a friend to the property. Harrah's is the oldest casino in Atlantic City's Marina District. The hotel boasts more than 2500 rooms, 4 fine dining and 5 casual restaurants, an 800-seat theater (Broadway-by-the-Bay), and 6 retail stores. The casino's most notable feature is its poker room, which offers daily tournaments. They have 40 tables with a "Total Bad Beat Jackpot" on all their poker games—both no-limit and limit. They spread games based on what kinds players are asking for. But in general, you'll find both no-limit and limit games starting at $1/$2 no-limit and $2/$4 limit Texas hold'em. The Total Bad Beat Jackpot is only one of their promotions. They also offer a $350 prize for the "Highest Hand of the Hour". If you play a lot of poker, you're also eligible for complimentary lodging and food at the property's restaurants. Harrahs is also the official home of the annual Atlantic City WSOP Circuit Events. The poker room also offers table-side food and beverage service. Harrahs brags on its website that they offer the "best table games in Atlantic City". That might just be promotional-speak, but they have a wide variety of table games to choose from, including the following. They also offer all the traditional casino table games you'd expect to find, like blackjack, craps, and roulette. Keno is also popular at Harrahs. They allow you to choose between 1 and 15 numbers, and you can win up to $250,000. The keno parlor is open from 10am to 2am every day. They offer over 2300 different reel and video slot machines to choose from. They also offer over 1500 different video poker games, for a total of over 3800 gaming machines. They also offer a $10,000 slot machine tournament every Monday. They belong to Caesars, so the same details about the online casino and comp program apply to Harrahs. Resorts Casino Hotel is the oldest casino on the Boardwalk. The casino has more than 100,000 square feet of gaming floor space, and the hotel features over 900 guest rooms. As a hotel, Resorts has a long, storied history. But the casino itself is relatively young. The hotel has a 1700-seat SuperStar Theater and a 350-seat theater in its Ocean Tower. The Ocean Tower also features an exclusive "1133" players club for "Epic Card" holders. Like all casinos in the city, Resorts offers various promotions, but they change based on when you're there. You can get the details on the latest promotions at the casino's promotions booth, which is located on the casino floor. The booth is open Sunday through Thursday from 9am to midnight. They're open an hour later on Fridays and Saturdays. They base all their promotions on how much action you bring to the casino—they track this via your player card. Some of the promotions that were available when this review was written include a sweepstakes for a 2016 Audi A3. Players can also get a free Margaritaville Halloween t-shirt. Like most Atlantic City casinos, they also offer an NFL pickem contest every Monday. Their prize pool for that contest is $2500. The casino offers more than 2500 slot machines and a variety of table games. The table games include all the standards, like baccarat, blackjack, craps, and roulette. They also offer many of the newer tables games, like Let It Ride, Texas Hold'em Bonus, and Four Card Poker. One unusual table game that seems to be unique to this property is Criss Cross Poker, which is dealt from a single 52 card deck. The game consists of 2 five-card hands, one across and one down. You can get payouts of up to 500 to 1 on this game. Members can play games online, but they must be within the New Jersey state lines to play for money. You can apply for casino credit online at their website. They also have their own players card, the "Star Card", which you can apply for. They do have an online casino, too, but like all the New Jersey casinos, you're required to be a resident of the state in order to play. The Tropicana Casino Resort on the Boardwalk in Atlantic City offers 2000+ guest rooms, a shopping mall called The Quarter, nearly 20 casual dining restaurants, 4 fine dining restaurants, a 2000-seat showroom, and an IMAX theater. The Tropicana is one of New Jersey's largest and most prestigious tourism properties. They also feature a free light and multimedia show in the front of the property. The casino at Tropicana has been voted "Luckiest" Atlantic City casino in Casino Player magazine for multiple years. You'll find 2600+ slot machines and 170 table games there. They also have a poker room. You can (and should) sign up for their players card. It's called the "Trop Advantage" program. It has 5 tiers, based on how much action you bring to the casino, and you're immediately eligible for the perks of being a green tier member. Tropicana prides itself on featuring new casino games, especially slots. You'll find the latest slot machines as well as some of the perennial classics here. They have a good selection of linked and standalone progressive jackpot games. They've won awards for their slot machines, too, including a bronze medal for "Best Casino for Slots" from Best of The Press. Strictly Slots awarded them #1 loosest nickel machines and #1 loosest quarter machines in 2013. They also won #3 loosest dollar machines. The Crystal Room, which offers slot machines in denominations ranging from $1 to $100 per spin. Palm Cove, which offers $1 video roulette and Super Times Pay Poker. Palm Walk, which is a nonsmoking area with over 200 different games. The table games at Tropicana are pretty standard, but they do run double comp points on table game play on a regular basis. The most interesting aspect of their table game selection is their Asian casino games section, the Jade Palace. There you can play mini-baccarat, Pai Gow Poker, and Pai Gow Tiles. Casino Player magazine awarded the property the award for best baccarat and mini-baccarat. The popular noodle bar in this area of the casino is another attraction. It's closed on Mondays and Tuesdays, but you can eat dinner there between Wednesday and Sunday. Poker enthusiasts are invited to "bring their own games" (contact the casino for details), may enter daily tournaments, and may qualify for special promotions including High Hand of the Hour, High Hand of the Day, and a complimentary room for Royal Flush (see casino for details). The Tropicana also has an online casino with the same geographic restrictions as the other online casinos headquartered there. The Trump Taj Mahal is also located on the Boardwalk in Atlantic City, NJ. The hotel offers more than 2000 guest rooms, 20 restaurants (both fine dining and casual), several cocktail lounges, the 1200-seat Xanadu theater, the 130-seat Blue Velvet Theater (where the Real Men of Scores perform), and the Mark G. Etess Arena--with a seating capacity of 5,000 for concerts and 4,500 for boxing events. The casino has nearly 160,000 feet of floor space, 2,517 slot machines, 130 table games, and a high limit gaming salon (the Baccarat Pit). The casino offers seasonal promotions like sweepstakes. In 2014, Casino Player magazine awarded the Trump Taj Mahal with the best casino promotions, best slot tournaments, and best comps awards. Their high limit "gaming salon" is worth mentioning. In fact, this is probably the best place for high rollers to play, especially if they love baccarat. The dealers wear tuxedoes, the rooms are lit by crystal chandeliers, and the audio and video are state of the art. High rollers can find over 2 dozen baccarat, blackjack, craps, and roulette tables. You'll also enjoy top shelf cocktails and appetizers while you play. Atlantic City's highs and lows as a major casino resort venue are famous. The city's casinos continue to compete for tourists and players through facility renovations, new investment, and high quality entertainment from sporting events to major concerts. One fact will remain constant, though—Atlantic City casinos will continue to change in various ways.